By using forms, clients can subscribe to your newsletters, and ask for, for example, offers via your website. Data can also be updated on their cards. After registration and data modification made on your website, follow-up sequences can start. If clients click on the link, particular field values on their cards are updated automatically with values that have been set by you. During data modification, follow-up sequences can start. If you want to separate proceedings of new leads by interest. To do this, insert a link into one or more emails and create different content for every link that corresponds to the interest of recipients. If you want to know whether your clients are interested in a topic or not, insert a “For more information, click here” link into the message. So you can measure how many people have clicked on the link. If you want to add tasks automatically. If the link contains a task field, they can be added automatically to a specific card by clicking on them. MiniCRM automatically records incoming emails sent to the address of the Incoming email manager and the contact details as a new card or a contact card (in case of a new client) within the relevant module. Cards are added with field values or even with tasks to that status that you have set previously. The system reminds the owners about the newly received requests. To list forms, go to a module and click on Forms [1.1.]. To filter them by type (Form, Link, Incoming email manager), click on an item [1.2.]. If double opt-in sign up is turned on, an exclamation mark is displayed to the right of the form’s status on the list. Fill out the form, that was created in MiniCRM, on your website. Are redirected to the thank you page. Are added to the status that have been given during sign-up and are able to receive emails sent automatically. Receive the email template that was set during sign-up. Are redirected to the thank you page, that was set during simple sign-up. Will stay in the status that was given during simple sign-up, until their email addresses have been activated. Receive the email template that was set during simple sign-up so you have to insert the activation link into that template. Click on the activation link so their email addresses become active in the system. Are redirected to the thank you page that was given during double opt-in sign up. Are added to the status that have been given during double opt-in sign up. Receive the email template that was set during double opt-in sign up (not required). Their email addresses are active so they will receive messages sent automatically. To create a new form, click on [New form] > [New form] [2.1.]. To modify a form, click on its name. You can name the form on the top of the editor page [2.2.]. 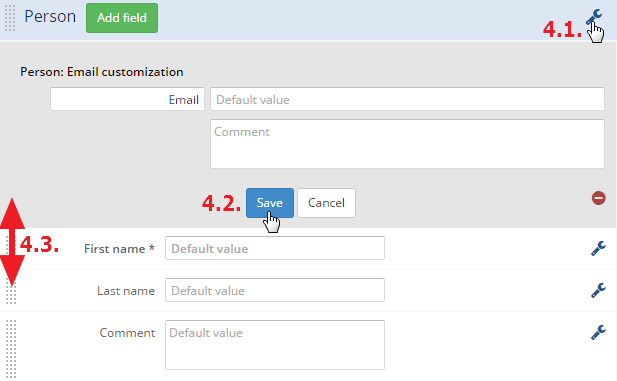 On the left side you can customize the form and its fields, and on the right side you can perform the following settings. You can choose one from the relevant module’s statuses. Clients who fill out the form will be added to the selected status. If you add a hidden Status field to the form, that status will be set. In that case clients can be even moved backwards in the pipeline. Copy the URL of the website you want loaded after the client filled out the form. If you check the Identify card option, you can insert another form into the thank you page that identifies the client. If you click on the [Choose template] button, you can choose one from the email templates that will be sent to the client after filling out the form successfully. The sender set in the relevant module is the sender of the email template. You can set a language for the error messages and default tags of the form. Each time add new Card: A new card will be added to the client by using data entered on the form. Choose this option if you expect repeat applications in a module that should be managed independently (e.g. offers, orders, tickets). By choosing this option, original contact details are updated with values given in the fields of forms. However, phone numbers and email addresses remain the same. New ones are always added in addition to the already existing ones. Update available Card: If a client already has a card in a module, it will be updated with data entered on the form. If more than one card belongs to the client, the one in the highest status will be updated. By choosing this option, original contact details are updated with values given in the fields of forms. However, phone numbers and email addresses remain the same. New ones are always added in addition to the already existing ones. Error message when Card exists: If a card exists in the system, the subscriber receives an error message. Choose this option if you want to avoid having a form filled out more than once by using the same email address. Clients can also send the forms using Unsubscribed email addresses; however, they still remain unsubscribed. It is not possible to submit forms from Not working email addresses and addresses having a Spam report filed. By choosing a template, the system sends an email when someone fills out the form successfully. The recipient can be the owner of the relevant card, an active user, or you can enter an email address. After filling out the form, the client has to click on the button under the fields to submit the registration or the changes. You can type a text, that will be displayed on the button, into this field. It is recommended to use this function in case of registration forms [3.]. If someone registers on your website, the template that was chosen as a confirmation email [3.1.] is sent to the client. You have to insert an email activation link into that email so the client can confirm the sign-up by clicking on the link. You can find the Registration Confirmation (activation required) email template, that contains the link, on the Templates page. If you are editing a custom template, you can insert an activation link by clicking on the [Insert variable] button and choosing the Other: Email activation link variable. After clicking on the activation link, clients are moved to this status. Two statuses can be selected. One for simple sign-up, and one for double opt-in sign-up. After clicking on the activation link, clients are redirected to this page. Optional field. The email template selected here will be sent out after a successful activation. The sender who is set for the relevant module is the sender of the template. To modify a box or a field, click on the Wrench icon [4.1.]. If you have finished, click on [Save] [4.2.]. To change the order of boxes/fields, grab an item and move it upwards or downwards [4.3.]. 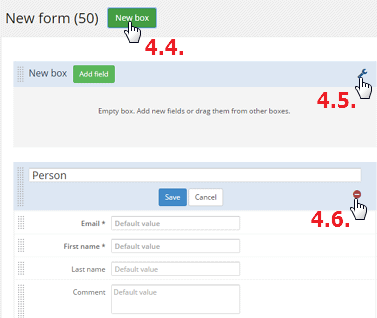 To create a new box, click on [New box] [4.4.]. To rename it, click on the Edit box (wrench) icon [4.5.]. To delete a box, click on the Edit box (wrench) icon, then on the red icon [4.6.]. Only those fields can be added to a form that already exist on cards and contact cards. So after filling out a form, data entered into fields will be recorded in the relevant fields on cards and contact cards. You can also add File fields to forms so your clients can upload pictures or documents. To add a new field, click on [Add field] [4.7.]. To perform settings, click on the wrench icon next to a selected field [4.8.]. To delete a field, click on the wrench icon, then on the red icon [4.9.]. Business name and First name fields are exceptions because they can be only deleted from a form together with the Email field and they can only be added to a form together with it. If you don’t find a field among the available ones, firstly, you have to add it to a card in a module, then you can add it to the form as well. Required: Filling out the Email, Business name / First name fields is required on every form. Clients don’t see these fields and don’t have to fill out anything so you can record data on cards without letting them know. By using this, you can avoid clients entering wrong data. Every field can be added as a hidden field, except for the Email, Business name / First name fields. To see the appearance of the form, click on [Preview] [5.1.]. Here you can change the appearance settings [5.2.]. The color code can be changed by entering a hexadecimal color code (six-digit code preceded by the # symbol). 2-2 digits indicate the red, green, and blue colors (in this order). You can find several color pickers on the Internet that can be used to select a color. You can copy its code to the form editor (without the # symbol). To see how the form works, click on [Preview] [6.1. ], and fill out the fields, then submit the form [6.2.]. So you can check whether the project is in the right module and contains accurate data. If you have entered a Thank you URL, you will be redirected to that page after submiting the form. Insert the line, that is displayed in the Inserting a form into your website [7.1.] section, into you website. The form will be displayed at the inserted line’s location on your website. If you are using this version, the form will always contain updated content. If you click on the To see a detailed description, click here. link [7.2. ], you can see the customizable version of the form. Keep in mind that if you change a field, you have to change the code of the customized form on your website as well. To insert the customizable version, copy the form’s HTML code and insert it into the source code of your website [7.3.]. If you click on the [Send insertion instruction email] button [7.4. ], instructions, that contain the HTML code of the form, will be sent to your email address. If you want to use more than one form, check the Identify card [8.1.] option. Then enter a website URL into the Thank you page field [8.2.]. 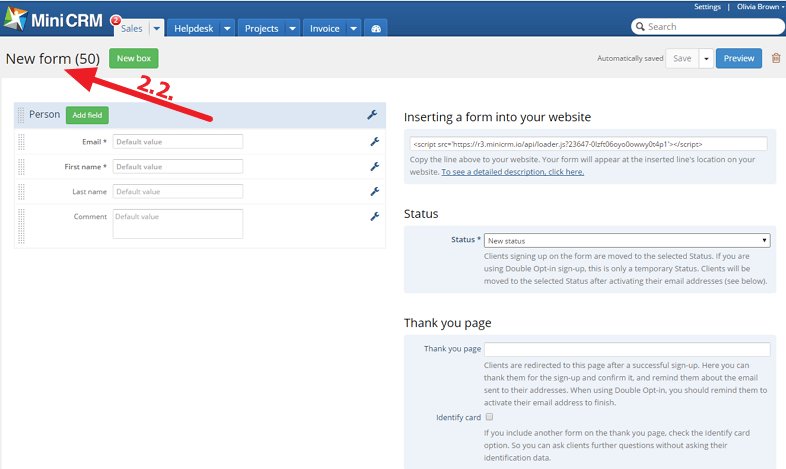 The second form that doesn’t contain an email field (that identifies the subscriber) can be added to this website. You can add the basic fields (name, email etc.) to the first form, and the additional ones to the second form. If it is necessary, you can add even more forms as well but make sure that you have entered the Thank you page URL correctly and always check the Identify card option. To create a link, click on [New form] > [New link] [9.1.]. If your clients click on the link, the field values of their cards are changed to values that you set previously. Firstly, you have to create the link, set the - hidden - fields, and values. The next step is to insert the link into an Email template. To do this, copy the link displayed on the editor page to a template [9.2.] or click on the [Insert variable] button and select the Links: New link variable [9.3.]. If recipients click on the link, click-throughs are tracked and the field values of their cards are automatically updated to the values that have been previously set. If you add a Status field, the card can only be moved within its group and only forwards. To create a new Incoming email manager, click on [New form] > [New Incoming email manager] [10.1]. You can redirect email addresses (e.g. help@companyname.com) to the address of the Incoming email manager [10.2.]. MiniCRM automatically records incoming emails sent to this address and the contact details as a new card or a contact card (in case of a new client) within the relevant module. It is recommended to set the redirected email address as the central sender of a module so your clients’ replies will be sent directly to the system. You can send Reply from cards that are sent as an email message to clients. If the client replies to that message, the email will be saved in History. You can also choose what status the new card should be added to, and what fields should be filled out automatically. By adding the Task: Mode of processing [10.3.] 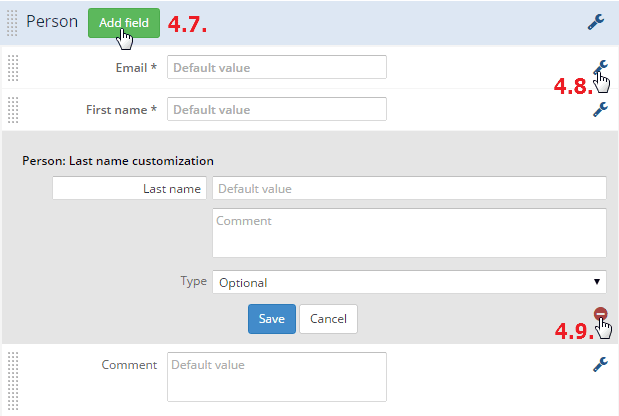 field, you can set an open email (Reply) for the user or assign a task. To delete a form/link/incoming email manager, click on its name, then on the Move to Trash icon [11.1.]. If you want to use the deleted item later, click on its name in the Trash, then on the Restore icon [11.2. ].